In similar fashion as with other types of products we review, we performed a web search so to identify some of the various brands of oral rinses that are available. For each product, we were interested in: 1) It's xylitol concentration [percent]. 2) The product's list of ingredients. Our web search fared quite poorly. In fact, the table below shows the only two we found. 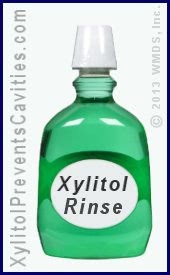 You can either buy xylitol rinse or make your own (see below). Most products didn't provide sufficient documentation. We commend the two above on making this information readily available. It reflects positively on them as manufacturers. After all, how can a consumer gauge their daily xylitol exposure unless they know how much is in the products they consume? How much rinse do you need to use? In the case of Epic's mouthwash, let's examine how much you would need to use in order to create a one-gram exposure of xylitol. It's simple enough to calculate that you would need to use four grams of a 25% rinse to create a one-gram dosing. But how much liquid is four grams? Well, assuming Epic's rinse has a density similar to water (a rough estimate), then a person would need to use on the order of one teaspoonful to create a one-gram oral exposure. That's a very small amount. In reality, a 25% xylitol product will have a density somewhat greater than water (since it is water + dissolved xylitol). We've seen manufacturer information for a 25% product that states it delivers a 1.5g exposure of xylitol per teaspsoon. Choosing a xylitol mouthwash by way of reading its ingredient list. Take a look at the list below and notice that water is the main ingredient (that's why we made the assumption above that Epic's product has a density somewhat similar to water). Xylitol is a solid at room temperature and therefore needs to be dissolved into a liquid in order to make a usable rinse. If the main ingredients in most rinses are just water and xylitol, why not make your own? How to identify high quality products. The best rinses (those with the highest concentration) will be those where only water is listed before xylitol. Also, lookout for the presence of the sugar sorbitol. If a product contains this sweetener, it suggests that the manufacturer has chosen to skimp on xylitol in favor of a cheaper compound. How to make homemade xylitol rinse. Once you've seen the typical ingredient list, a question that often comes to mind is why not just make your own? Well, you certainly can. First off, you'll need to know how much xylitol exposure you'll get from your homemade rinse. As a point of reference, one teaspoon of granulated xylitol weighs about four grams. To create a 1 gram exposure, start with a smallish quantity of water (however much liquid you want to rinse with) and mix in 1/4 teaspoon of granulated xylitol (that's not very much at all). Rinse with this solution for about 30 seconds or so. If the granulated xylitol hasn't fully dissolved in the small amount of water you have dispensed, you can just add more (or use warmer water). Or, just go ahead and start rinsing and let it finish dissolving while you swish. Since xylitol is a food item (a type of sugar), when you're finished you can either spit it out or just swallow (homemade rinses only, for commercial products, read their directions). Remember though, it's only the xylitol that's in your mouth that has any effect on the bacteria that cause cavities. Swallowing provides no additional benefit (however, it will add a few calories to your diet). From the standpoint of developing consistency in technique, with kids the best plan might be to spit out. That's because most other types of oral products (fluoride rinse, mouthwash) absolutely should not be swallowed (see below). Spitting out would also be the best plan for those who have experienced difficulties with xylitol side effects. Manufacturers sometimes include additional compounds in the formulation of their rinses. For example, some contain oral moisturizers that can be a benefit to those people who have a chronically dry mouth. As discussed elsewhere on our pages, the use of both fluoride and xylitol to prevent tooth decay are complimentary. Both work by different mechanisms and can be used together. Toward this goal, commercially prepared xylitol rinses are often formulated with fluoride. Parents need to be aware of this and consult with their child's dentist for directions. The inappropriate use of fluoride (such as swallowing it) can result in a dental condition termed fluorosis. Suppose one were to dissolve 32g xylitol into 16 ounces of commercial fluoride mouthrinse? Each half ounce portion would contain 1g xylitol. Would that be a proper dosage? obviously not to swallow. Remember, for best results you should spread your xylitol exposure out over the course of your entire waking day. In comparison, fluoride rinses are usually just used once a day or else after brushing (depending on the product). So, generally, the way each is used is different. But tying every dosing of xylitol to a fluoride exposure may cause you to exceed the fluoride rinse's recommendations. Keep in mind, even if spitting out you will still swallow some of the residual solution that remains in your mouth. In the case of fluoride, if a child ends up swallowing too much it can cause tooth staining. Have you looked into Carifree.com's products? They seem promising and know what they're talking about. They are pricey though so was hoping someone not looking to benefit financially (hint hint) might take a look at their products. If it's good stuff, I'm totally willing to pay the price, otherwise I'm making my own at home. We list products in our product tables simply based on their reported xylitol content. With CariFree, their website clearly stated levels for their rinses, toothpaste and lollipops, so we added them to our respective lists. Thanks for the heads up about them. In general, it seems that the focus of their products is multifactorial. They combine multiple ingredients in an attempt to combat decay on a number of different fronts. In theory, this sounds reasonable and fine. However, our site is just about the use of xylitol in preventing cavities. That makes passing judgement on these products beyond the scope of what we do. But in regard to being a xylitol source, the products we've included in our tables seem like acceptable choices. In regard to the DIY option, I just get my xylitol exposure from sprinkling it into/on foods and beverages. It never really crosses my mind to purchase prepared xylitol products. We've edited this page per the issue you pointed out. Thank you again for the input. There's a good company named Xlear Spry. I've ordered & used their mints & their gum. They list the ingredients, & their products were recommended by our dentist. Now she wants both of us to use a Xylitol rinse in our Waterpik oral irrigator. There's another product, TheraSol, with Xylitol, but I can't find a list of ingredients. Very important, as one of us has Celiac disease, so has to be gluten free. Basically I need a recipe for a rinse that's good for use with an irrigator. Read the "How to make homemade xylitol rinse" section above on this page. In that amount of liquid, add 1/4 teaspoon of xylitol for every 1 gram of exposure you want to create. Creating a 1 gram exposure seems reasonable, but 2 would be OK too, depending how often you irrigate and what other xylitol sources you have during the day. I think you would need to make sure that the granular aspect of your xylitol was 100% dissolved (so to insure that it doesn't mess with your irrigator's mechanism). Possibly you should run some plain water through it afterward too (or call Waterpik and get their opinion on the matter). Thanks for the heads up about the other two brands. We already had some Spry products listed but due to your comment found more to add. The only way a consumer can pass judgment on a product is if the manufacturer makes it easy to confirm its xylitol content. It would have taken them less time to add that information to their website in an obvious fashion than it did for me to post this answer to your comment. Either they don't care about the consumer and their need to gauge their xlitol exposure, or are trying to hide the fact that their product contains very little of it. We recently purchased a water flosser that has a special tip for Xylitol toothpaste tablets. It's called Welflosser. Been using it for several months and love it! what about just sprinkling some xylitol on my regular toothpaste? Using that method introduces the issue of the abrasiveness of the undissolved xylitol crystals on tooth surfaces. We don't know of any studies that have investigated this point. In theory and over the long term, it's conceivable that some damage might occur. Using dissolved crystals as a rinse, or just placing crystals in your mouth after brushing and letting them dissolve, avoids this issue totally. Quantifying the exact dosing you are creating would also be more accurate with these methods. I just found out about a new xylitol mouthwash company called ................. They make 17.5% xylitol containing mouthwashes and they have really unique flavors. You can order on their website. Thanks for the heads up. We checked the website of the company you mentioned, and viewed the product images it showed. Despite what you reported and after several minutes of searching, we found absolutely noting on the website or its pictures of product labels that stated what percentage of xylitol that mouthwash contains. We refuse to support companies that don't readily reveal that information to consumers, and for that reason will not include those products in our product lists. Too little xylitol exposure is ineffectual, too much tends to produce unwanted side effects. Every consumer has the right to expect that information on the products they buy so they can monitor their exposure level. Dose of xylitol per day? 1gm? I have dry mouth and like to spritz my mouth about 5 times per day. Is 1 gm the limit or per dose? I mix my own. For an adult, it would seem that 5 grams per day (per your 5 applications per day) would be on the low side of what most studies have suggested is ideal. If following those guidelines, you would want to make your rinse sightly more concentrated. Studies about Xylitol dosing for adults. Hello I'm wondering if it's fine to mix water with xylitol powder and store it in plastic bottle? To have it ready for use every morning and evening? Or is it better to mix it fresh before every use? As far as effectiveness in preventing cavities goes, your plan would seem fine. There might be a consideration (we really don't know) of bacterial growth in a xlyitol solution stored over relatively longer periods of time (xylitol has its effect on some of the types of bacteria that cause cavities but not all types of bacteria as a whole). you need to have a scale to measure xylitol granules because it is a solid. think of it like this...substitue xylitol with gold because now we want a 1gm per serving of gold admixture (assume gold is soluble in water like xylitol is) Do you still think a 1/4 teaspoonful gives you 1gm (of gold) What about aluminum? It weighs much less than gold relative to size. I made some toothpaste from a recipe I found on the web. It said to powder the xylitol so it wouldn't be so abrasive. Then you only put a tiny bit on your toothbrush. Brushing twice a day, you wouldn't get enough xylitol. I have a lot of powder left with no scale. Do you know how much powder would equal 2 teaspoons of granules? Thanks. Xyltiol is sold in powder form. We've looked at the labeling on 3 brands. For commercial preparations, a common measurement is 1 teaspoon = 4 grams weight (the same as granular form). So evidently there's no significant difference in how you would measure commercial granular vs. powder xylitol. I like that Carifree also has fluoride, but the xylitol is list as the last ingredient so how much xylitol could you really be getting in a mouth swish? To that product's credit, their website states its formulation is 25% xylitol. And information on their site indicates that a 1 teaspoon amount will create a 1.5g exposure of xylitol to your mouth. Like you, we think that using xylitol in combination with fluoride makes a great idea. FYI: The ingredient list on the packaging of that product is organized alphabetically. That's why xylitol is listed last (note water is second to last). We were confused by that initially too.